Leading American environmentalist Bill McKibben was enthusiastic about the newspaper's message and the methods BeyondTalk.net calls for. "We need a political solution grounded in reality - grounded in physics and chemistry. That will only come if we can muster a wide variety of political tactics, including civil disobedience." "Non-violent civil disobedience has been at the forefront of almost every successful campaign for change," said Andy Bichlbaum of The Yes Men, who helped write and edit the newspaper and are furnishing the technology for BeyondTalk.net. "Especially in America, and especially today, we need to push our leaders hard to stand up to industry lobbyists and make the sorts of changes we need." 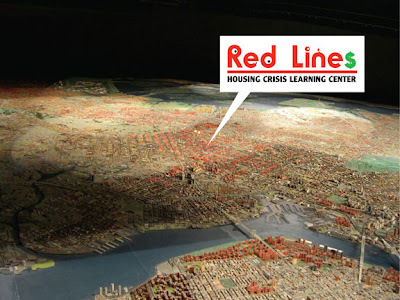 "Roosevelt would never have been able to push through the New Deal if people hadn't taken to the streets, occupied factories, and demanded it," noted newspaper writer/editor and University of California professor Lawrence Bogad. Segregation, British rule in India, and apartheid wouldn't have ended without a lot of people being creatively uncooperative - even if that meant getting arrested. Nonviolent civil disobedience is the bread and butter of progress." The fake newspaper also has an ad for "Action Offsets," whereby those who aren't willing to risk arrest can help those who are. Today's fake International Herald Tribune is part of a rash of recent publications which mimic prominent newspapers. 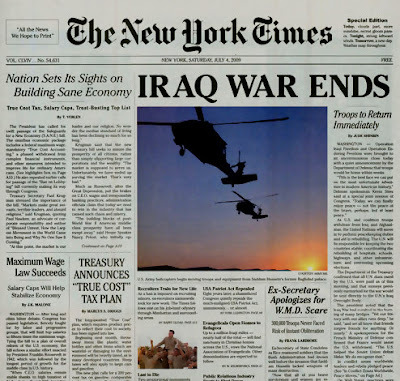 Last November, a fake edition of the New York Times announced that the Iraq War was over. A few days earlier, a hoax USA Today featured the US presidential election result: "Capitalism Wins at the Polls: Anarchy Brewing in the Streets." And this April 1st, a spoof edition of Germany's Zeit newspaper triumphantly announced the end of "casino capitalism" and the abolition of poor-country debt. The rash of fakes is likely to continue. "People are going to keep finding ways to get the word out about common-sense solutions those in power say are impossible," said Kelli Anderson, one of the designers of the fake International Herald Tribune and co-designer (with Daniel Dunnam) of BeyondTalk.net. "We already know what we need to do about climate change," said Agnes de Rooij of Greenpeace International. "It's a no-brainer. Reduce carbon emissions, or put the survival of billions of people at risk. If the political will isn't there now, it's our duty to inspire it." 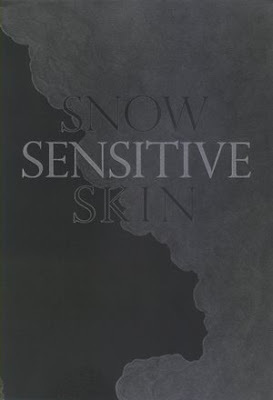 Here is a review I wrote of Taylor Brady's and Rob Halpern's collaboration Snow Sensitive Skin, published in a small edition chapbook by Michael Cross' Atticus/Finch press back in 2007. I hope this book will come back into print, as it has so much to say about the state of lyric today in relation to the disasters which have come to define daily social existence and geopolitics. Few books I have read feel closer to the "real" of our super mediated present. Few books are also as intensely musical, during an age in which most of the poetry that counts is resolutely against lyricism except to sample, parody, or simply destroy it from the inside-out. Snow Sensitive Skin proves that prosody can be an effective counter-hegemonic strategy in any age, but especially this one.